At Easter 2016 a gastronomic experience with a menu which tastes tradition. Do you know the treatise on cooking “ La Scienza in cucina, l’arte di mangiare bene” ( Science in the kitchen, the art of eating well), by Pellegrino Artusi? It is considered the recipe book who allowed the Italian language and tradition (not only the gastronomical one), to blend and become something unique. In fact it is the first recipe book issued after the unity of Italy (1891), that got an amazing success: in 1968 a publishing survey estimated that 1.286.000 copies were sold, taking into account only the leading publishing houses. Actually, the book reveals a sense of care and method of a rising Italian cooking that had never been classified before. Our chef, on the occasion of Easter 2016 is making a menu drawing inspiration from Pellegrino Artusi. 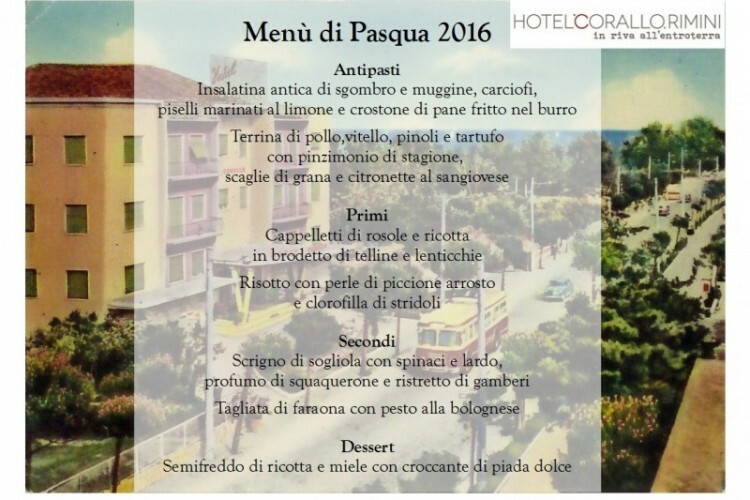 The gastronomic experience at Hotel Corallo at Easter 2016 will be richer. We have got the gluten free version, exactly alike the original menu, a piece of history brought on the table by the chef Giuliano Auletta. “I drew inspiration from Artusi because in his recipe book there are fundamental meanings linked to food: for instance, the guinea-hen, that we use to prepare, was served only to important guests. Even pigeons were destined to parties only. A curiosity that made me smile? The ‘tagliatella’ from Romagna, for Artusi was revealing: the longest it was, the best the housewife ‘l’azdòra’ was. That is why in Romagna the ‘tagliatella’ par excellence was long, extremely long!What can I say more? We are waiting for you to live an experience that won’t mean food only but also culture, excellence and tradition!